Turn the rim of the cylinder and make a beautiful curved shape called a hyperboloid. 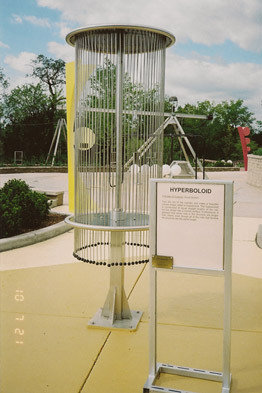 The hyperboloid is constructed of equal straight lengths of the rod, but the shape has a curved surface. Furthermore, it appears that some rods in the structure are longer than others, even though all of the rods that formed the structure are the same length.